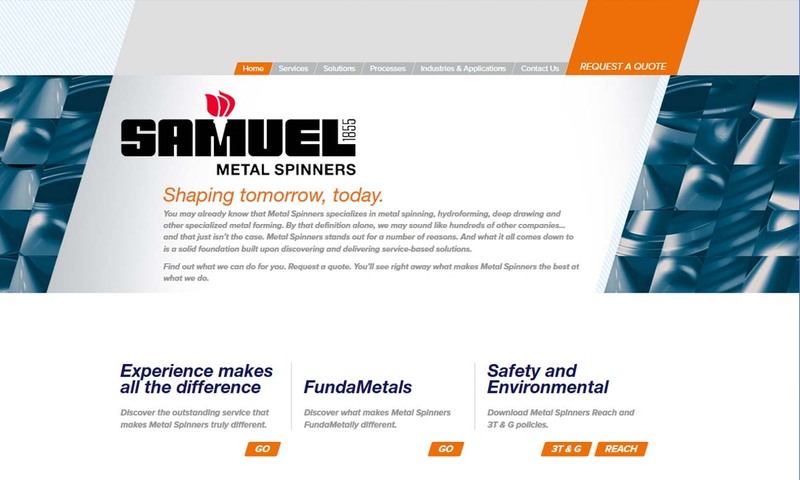 A reliable source for Metal Spinners information and a resource for accessing leading Metal Spinners and suppliers. Metal Spinning Metal spinning is a cold metalworking process used to shape flat metal discs or tubes (known as blanks) into axially symmetrical parts. 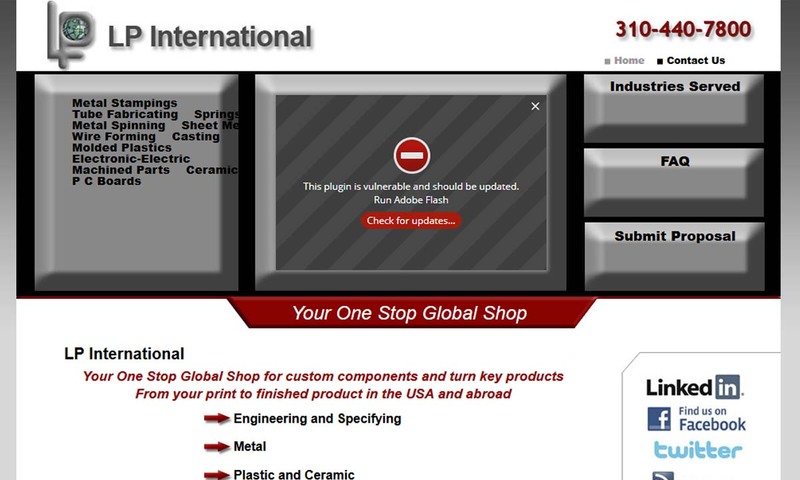 Globe Engineering manufactures what other job shops find difficult. 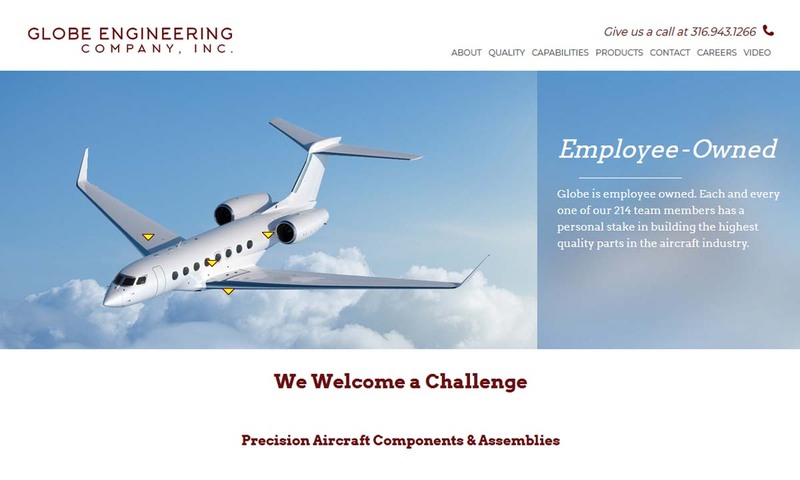 For nearly 50 years, Globe has specialized in the fabrication of precision parts for the aircraft and aerospace industry. Metal Spinners provides metal spinning with quick turnaround times and on-time delivery for measurements from merely inches to over twelve feet. Some of our services include stainless steel metal spinning and aluminum metal spinning. L P International is a 73-year old US Manufacturer of Metal Components and a Direct Importer from China, Taiwan and Europe since 1960. LPI is a primary domestic fabricator of straight and bent tubing, sheet metal, and spun metal components. 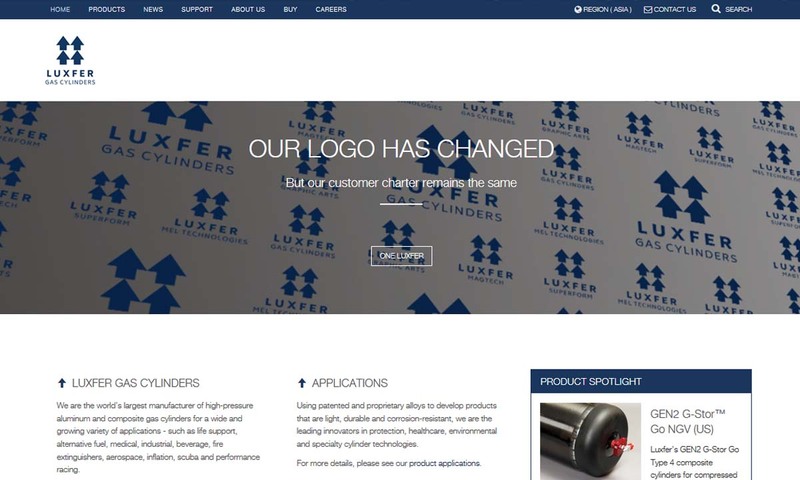 Established in 1897, Luxfer Gas Cylinders is the world leader in the development, production and supply of seamless, extruded aluminum and composite high-pressure cylinders for the storage of a wide variety of gases. 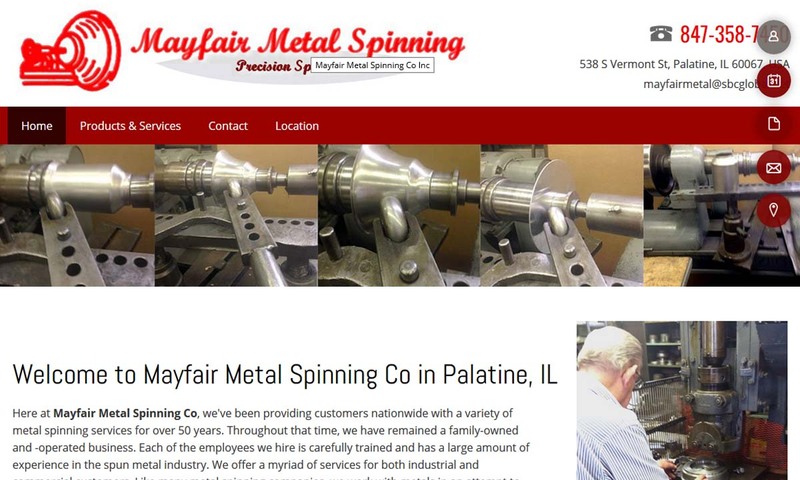 Mayfair Metal Spinning is a manufacturer of precision metal spinnings and provides metal stamping, deep drawing, welding and anodizing services. Materials include aluminum, brass, bronze, copper, titanium and stainless steel. Relatively speaking, the process of metal spinning is fairly straightforward. First, a formed block is mounted in the drive section of a lathe (which is simply a tool that rotates a workpiece on its axis). Lathes may operate horizontally or vertically, and they can be manually operated or controlled by CNC (computer numerical control). The block in the lathe — also known as a chuck or a mandrel — typically consists of hardened wood or metal (such as mild steel or aluminum). (Although using wood is cheaper, using metal for a mandrel is desirable if high tolerances are necessary.) Once the mandrel has been set in place, a pre-sized blank (typically in the form of a flat circle or disc) is clamped against it with a pressure pad. The pressure pad, in turn, is connected to the part of the lathe called the tailstock or foot stock (a type of horizontal bar that is used to lend support to the longitudinal rotary axis of the workpiece.) Once this entire assembly is in place, the process of metal spinning can begin. Together, the mandrel and workpiece are rotated at high speeds as some type of forming tool presses against it, causing the workpiece to flow over the block and shape it via friction. The external form of the mandrel corresponds to the internal dimensions desired for the particular workpiece. The tools which shape the workpiece over the mandrel may be up to three feet long and are usually made from hardened steel or solid brass. (The former is best for use with aluminum, while the latter is best for use with mild steel or stainless steel). The most common types of spinning tools are known as spoons. Rotating tools, especially those used with CNC spinners, may also be coated with a thin film of ceramic, which protects and prolongs their life. If a lathe is CNC-operated, spinning tools will perform a specific sequence of operations on a workpiece that has been programmed beforehand. Once a workpiece has been mostly shaped, it often undergoes trimming and/or finishing operations. (In this context, “trimming” refers to the smoothing out of any sharp edges.) Workpieces continue to be rotated during finishing operations (up to 1200 RPM) in order to require the minimal use of force. The “duck bill” is a special type of finishing tool containing both flat and rounded sides that is used to finish straight surfaces and curves (respectively). Various lubricants (e.g. wax, tallow, greases) are also used during finishing to improve surface appearance and to facilitate workpiece removal from the block. While the basic metal spinning process is fundamentally the same, certain aspects of it can be varied in several ways. A couple of examples follow below. • If a workpiece is complex, it may be formed on a multi-piece block so that it can be removed more easily. If the shape of a workpiece is highly complex, it may even be spun over an ice form (which will just melt away afterwards). • Another variation of the metal spinning process involves the forming tools. In many commercial processes, spoons are replaced with rollers attached to the ends of levers. Rollers vary in thickness and diameter and can be used to form material down to the mandrel in both CNC and hand metal spinning operations. There are a few variations on the entire metal spinning process itself, such as reducing or necking and hot spinning. Hot spinning, as its name implies, incorporates high heat into the spinning process. In this case, the high heat, which is applied to the workpiece, is sourced from a torch. Parts made via hot spinning can be shaped or reduced down to smaller diameters with seamless shoulders using minimal force, because the heated metal distorts as it is shaped. Some blanks or workpieces are spun after being annealed (i.e. heated and then slowly cooled). Another popular variation on metal spinning is flow forming. Flow forming is an advanced process allows for variation in product wall thickness using two main methods: shear spinning and tube spinning. Shear spinning produces contoured shapes or cones using rollers over flat blanks on rotating mandrels. Using the shear spinning method, no material is lost and the diameter of a blank does not change, but instead, thickness decreases variably, based on the angle of the mandrel. Tube forming produces cylinders and tubes by cold-working tubular preforms with rollers and a mandrel and using one of two techniques. Forward flow forming produces parts with one closed end. The bottom of the preform is positioned on top of the face of the mandrel, while it is moved in the same direction as the rollers. On the other hand, reverse flow forming produces parts with two open ends. The rollers push against a serrated ring placed at the end of the mandrel. This action compresses and extrudes the metal. Because metal spinners work by forming sheet material over an existing shape and not removing material, they produce very little metal waste. Furthermore, all finished parts — if formed correctly — have neither wrinkling nor warble. Metal spinning is a relatively simple process, possessing only three main steps (forming, trimming, and finishing). Press forming, in contrast, requires eight main steps. Its simplicity allows it to be used for both prototyping and major production runs. Metal spinning is highly cost-efficient due to comparatively low tooling costs, its focus on using a single piece of metal, the ease of making the process automated, etc. Metal spinning is not without its disadvantages. Unlike deep drawing or pressing, it is not particularly versatile in terms of products created; only rounded or concentric metal parts can be created via metal spinning. Metal spinning can also be unforgiving in terms of perfect formation and/or tolerances. Unlike some other processes, it is simply not cost-effective to repair a cracked or dented workpiece that has been spun. Metal spinners produce products that are used in a variety of industries, such as aerospace, appliances, architecture, defense contracting, food processing, healthcare, interior decorating, music, paper, pharmaceuticals, and more. Specific parts and products created by metal spinners include rocket nose cones, nozzles, pressure vessels and gas cylinders, filter housings, cartridges, specialty lighting, engine parts, freezers, mixing bowls, funnels, decorative household goods and urns, cookware, brass instrument bells, and public waste receptacles. Some specific shapes commonly produced by metal spinning are conical (cone shaped), parabolic (bell shaped), toroidal (donut shaped), Venturi (hourglass shaped), etc. The rounded metal parts produced by metal spinning are equally valuable for both practical and aesthetic applications. A vase is a good example of a metal spun object that can serve both purposes. Clearly, metal spinning is a wonderful resource. However, those interested in utilizing metal spinning services must take several things into consideration in order to maximize the advantages of the process. Potential metal spinning customers need to weigh whether metal spinning is the best metalworking method for their specific application in the first place. As has been alluded to previously, metal spinning carries disadvantages even though it is generally simple and cost-effective (e.g. metal spinning lends itself to undesirable metal thinning more so than other processes). Even though they may be more expensive, other metalworking processes may turn out to be a better option. Weighing factors in choosing metal spinning options does not need to be made alone. The input of a trusted, quality metal spinning manufacturer is invaluable.  Those interested in requesting a metal-spun part or parts must take care to check on several characteristics of a supplier’s output capabilities, including number and nature of locations (e.g. whether they offer in-house tooling), number and type of lathes, range of metals that are spun (some suppliers only offer parts made from a certain type of metal, like aluminum or stainless steel), range of other product variables (some suppliers only make products in certain sizes, diameters, and thicknesses), average turnaround times (2-3 weeks is reasonable), and optional “post process” services (e.g. welding, powder coating, washing, etc.) With the proper research and communication, metal spinning customers will be able to find the metal spinning service they need.